Teams from Carlisle, Guisborough and Newcastle joined finalists from other school teams across the country at the national final of ICAEW BASE. Northern Society of Chartered Accountants hosted 3 of the ICAEW’s 46 regional heats of this prestigious national school’s competition in February and March 2015. The Teesside heat winners Prior Pursglove College from Guisborough, along with Newcastle winners Newcastle High School for Girls and Cumbria winners Carlisle College all attended the national final of BASE 2015 in Birmingham on 25 June 2015. More than 500 teams competed nationally attracting more than 3,000 students. BASE links schools, students and employers to develop employability skills and provide an insight into what a career in accountancy, business and finance might be like. Assuming the role of ICAEW Chartered Accountants, the students had 3 hours to analyse a business situation, before presenting their ideas to a panel of top business professionals. The students completed the competition under their own direction but each team was also supported by a member of ICAEW who acted as their mentor. NEYCAG Chair Amanda Williams acted as mentor for Newcastle High School and attended the national finals in Birmingham with the team. Amanda said, “I was really pleased to work with the team from Newcastle High School who worked effectively as a team as well as demonstrating some excellent commercial analysis. I really enjoyed being part of the BASE final and encourage others to volunteer at BASE 2016 events”. During the ICAEW BASE awards ceremony, Newcastle High School were awarded the Best Financial Analysis award. 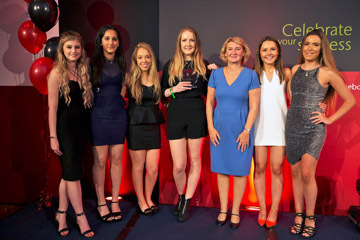 Photograph shows members of Newcastle High School for Girls receiving their award for Best Financial Analysis prize from Helen Drew, Past President of Birmingham and West Midlands Society of Chartered accountants. ICAEW BASE returns to the North East and Cumbria in 2016 with heats in Carlisle (24 Feb 2016) Newcastle (9 March 2016) and Middlesbrough (15 March 2016). For further information about BASE 2016 and how to participate please visit icaew.com/base. If you are a recently qualified ICAEW member and would like to assist as a mentor for one of the teams during BASE 2016 we would also be delighted to hear from you. Please contact Joanne Lucking joanne.lucking@icaew.com for details. Northern Society of Chartered Accountants (NorSCA) represents 4,000 ICAEW members and ACA students working in business and the finance profession across the North East of England, Teesside and Cumbria. We have been assisting businesses in the north of England and producing chartered accountants for over 130 years. Our members are part of a worldwide network of 144,000 ICAEW Chartered Accountants who help people do business with confidence.